People who locate a home in need of repair can now buy the home and finance the repair costs in one loan. This is an ideal opportunity to acquire a fixer-upper that is in need of some TLC. The rates used for the FHA 203k loan are very close to the rates used for a typical FHA mortgage. Sellers who are trying to sell a home in need of major repairs now have the option of lowering the price and deferring the repairs to the buyer. For qualifying borrowers, the same guidelines for a typical FHA loan are used for the FHA 203k program. The need for a 3.5%* down payment, loan limitations, lenient credit qualifications and proof of income are all applied and used in the exact same manner. Borrowers may still receive a gift for the down payment and the seller is allowed to pay closing costs. In order to determine the loan amount, the underwriter will look at several factors. The original purchase price, the totals of the bids for repairs, any renovations, as well as the new property value based on the completed work. These items will allow the underwriter to determine how much is available for the loan. The mortgage interest rates for the FHA 203k loan are very close to the rates used for a typical FHA mortgage. In addition, the same guidelines for mortgage insurance apply to the FHA 203k loan. The property must be an owner-occupied single family home, duplex, three-unit or four-unit home. The property’s construction must have ended at least 12 months ago. Any of the previously mentioned multiple-unit homes can be converted to a single family home. Conversely, a single-family home can be converted to a duplex or three-unit or a four-unit home. In all of the situations mentioned above the borrower must live in the property as their main residence. For multi-unit properties, all the units must be connected. If a home has been demolished, the property is eligible for a 203k loan if the original foundation is still intact. Condos can be eligible if the condo complex is FHA approved. Co-op homes are not eligible for the loan and neither are manufactured homes. Most existing properties will be eligible for the FHA 203k loan with the exception of manufactured homes and Co-op homes. 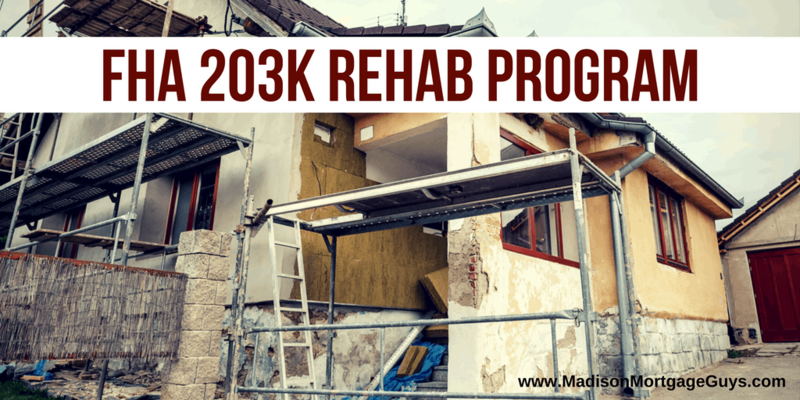 When buying a home under the FHA 203k program the use of a licensed contractor will be necessary. The contractor will visit the home, likely with the appraiser, and make several notes. It is the responsibility of the contractor to provide a written plan for all the repairs and improvements to be made along with the associated costs. The contractor will need to have licenses and be bonded to the specific work that is being done to the home. The contractor will also need to agree in writing that the work outlined in the estimate will be finished for the stated price and in the stated time period. As the name implies, the FHA 203k Streamlined mortgage is designed with less paperwork and fewer restrictions on the loan. The borrower can do up to 35,000 worth of renovations to make repairs and improvements. Repair existing patio, deck or porch. Any of these can also be replaced. 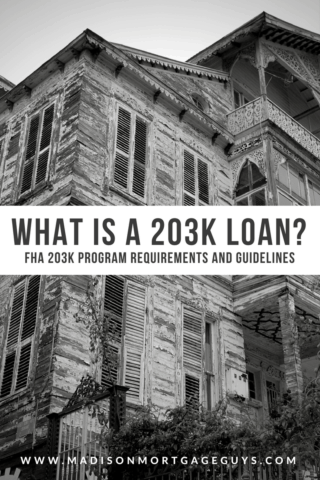 The FHA 203k Streamlined loan is designed for smaller repairs and improvements. If a borrower finds a property that needs major work done to the structure of the home then they will need to use the FHA 203k Standard product. This loan will allow the borrower to exceed the $35,000 cap from the 203k streamline. In fact, there is no maximum amount for the repairs at all. Only the loan amount is subject to a maximum restriction. Any item that is considered a luxury, such as a new swimming pool, a new Gazebo, a new BBQ or a new Spa is not allowed on either the FHA 203k Streamlined or Standard mortgage. What Does A HUD Consultant Do? If a borrower chooses to use the FHA 203k Standard mortgage there will be a requirement for a HUD loan consultant to be involved with the mortgage. The role of the loan consultant is quite important. This certified individual will make an initial inspection of the home and compile a report of their findings. After consulting with the appraiser and construction contractor the consultant will then prepare a Feasibility Study of the necessary repairs. After the loan is approved and closed the consultant’s job is not done. During the construction and repair phase, the money will be disbursed to the contractor on a draw basis. It is the consultant’s responsibility to inspect the progress of the work and approve the contractor’s request for draws. When all of the work is complete the consultant will also need to inspect the home to ensure that all the planned improvements and repairs have been made. In essence, the consultant is a supervisor over the contractor to ensure the correct work is recommended and then to follow up and make sure the work is completed. The FHA 203k loan consultant is there to protect the borrower and make sure work is done correctly and on time. Along with the responsibilities mentioned above, the loan consultant is also responsible for developing the contingency amount for the 203k loan. The contingency is designed as a cushion for the borrower to make sure there is enough money to complete the necessary repairs. The contingency will be 10% up to 20% of the total loan amount. If the home is more than 30 years of age, the contingency will be 10% at a minimum. If the utilities are not turned on then the contingency will be 15% since the electrical and plumbing systems cannot be fully tested beforehand. If the contractor’s costs go above the estimated price, the contingency will be used to pay for the overage. In addition, if there are changes needed after the loan is closed the contingency will pay for the changes. The FHA 203k loan uses a contingency reserve to protect the borrower against unforeseen costs of repair. When the loan has been approved by the underwriter it is time to sign the documents and close the loan. At this time an escrow account will be set up. The money needed for the repairs and improvements will be placed into the escrow. The contractor is not normally paid money up front, but if requested can receive 50% of material costs at closing. A maximum of 5 inspections will be done during the duration of the work. At each inspection, the contract can request a draw. As long as the loan consultant agrees with the contractor then the draw will be disbursed from the escrow account. Once all the work is completed and the home has been inspected for a final time, any remaining funds due to the contractor will be paid from the escrow account. Remaining money from the reserve set aside will be applied towards principal reduction. It is at this time that the homeowner can move in and take possession of their new property.